One of the big unknowns in predicting climate change is the billions of tons of carbon frozen in Arctic permafrost. As global warming causes soil temperatures to increase, some of this carbon will decompose and enter the atmosphere and accelerate climate change. Although permafrost carbon has the potential to be a huge player in the planet’s climate, it’s difficult to predict the amount that will enter the atmosphere for a given increase in temperature. That’s because the current way to estimate feedback between permafrost carbon and climate is by using complex Earth system models that include a wide range of atmospheric and land surface phenomena. 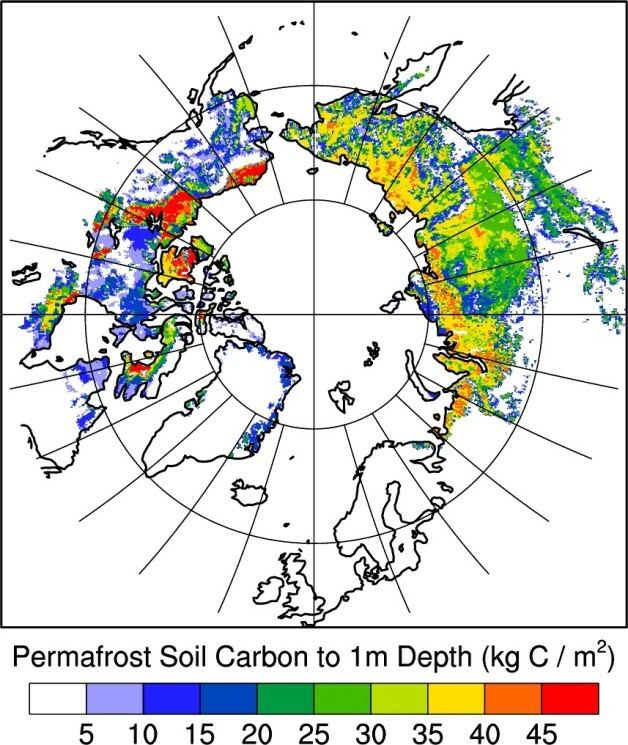 When it comes to representing the dynamics of permafrost carbon, these models don’t use data from direct observations of the amount of carbon that is currently frozen in Arctic permafrost. Now, a team of researchers led by a scientist from the Department of Energy’s Lawrence Berkeley National Laboratory (Berkeley Lab) has developed a simple model of permafrost carbon based on direct observations. Their approach could help climate scientists evaluate how well permafrost dynamics are represented in the Earth system models used to predict climate change. The scientists present their research in a paper published online Oct. 5 in the journal Philosophical Transactions of the Royal Society A. Their approach takes into account recently developed soil carbon maps that identify the distribution and type of carbon in permafrost soils in Alaska, Canada, and Russia. It also includes a meta-analysis of several lab studies in which permafrost was held at a constant above-freezing temperature for months or even years. These incubation experiments quantify the rates of carbon lost due to permafrost thaw. A third component is a meta-analysis of soil thermal models that track soil dynamics in response to climate warming. These models account for the effects of melting snow, freezing and thawing of soils, and differences in soil thermal properties, to name a few phenomena. The scientists ran their simplified model under two scenarios. In one scenario, fossil fuel emissions begin to curb dramatically by the middle of this century and the global temperature increases 1.8 degrees Celsius. In the other scenario, fossil fuel emissions continue at current rates unchecked and the global temperature increases 3.4 degrees Celsius. Koven notes that their approach doesn’t include many important processes that may increase or mitigate carbon release from permafrost soils. The research was funded partly by the Department of Energy’s Office of Science. A paper on this research, entitled “A simplified, data-constrained approach to estimate the permafrost carbon-climate feedback” is published online Oct. 5 in the journal Philosophical Transactions of the Royal Society A.